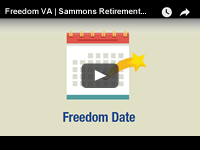 Thanks to our partnership with 25+ fund families, Sammons Retirement Solutions is able to offer you access to a wide variety of value-add materials. Download materials using the links below. Since Congress passed the sweeping Tax Cuts and Jobs Act (the "Act") at the end of 2017, the IRS has issued substantial guidance interpreting portions of the Act. Much of this guidance favors investors by softening limitations and disallowances that the Act imposes. 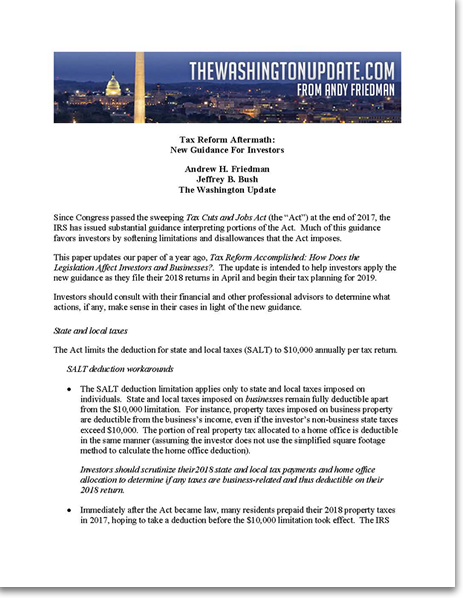 This paper updates (Andrew H. Friedman's and Jeffrey B. Bush's) paper of a year ago, Tax Reform Accomplished: How Does the Legislation Affect Investors and Businesses? The update is intended to help investors apply the new guidance as they file their 2018 returns in April and begin their tax planning for 2019. Tax laws have resulted in higher taxes for many. Now may be a good time to develop an investing strategy to help reduce your tax liability. 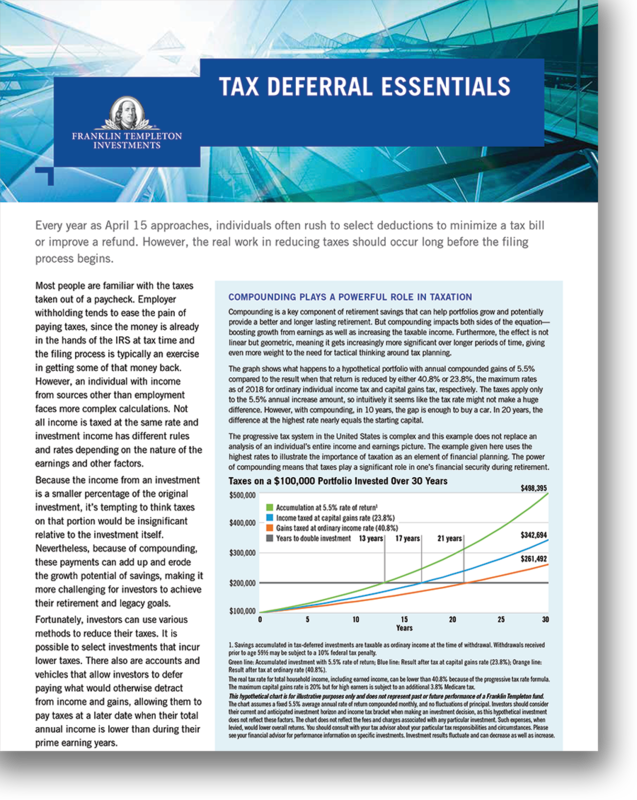 Learn more about minimizing tax bills by better understanding compounding's role in taxation, the variable ways investment income is taxed, and the products that feature tax deferral as an option. When choosing investments for placement within tax-deferred accounts, it may make sense to pick those subject to the highest tax rates. Such investments include those that generate taxable income, that may be taxed at higher rates, or mutual fund strategies that generate more annual tax liability. 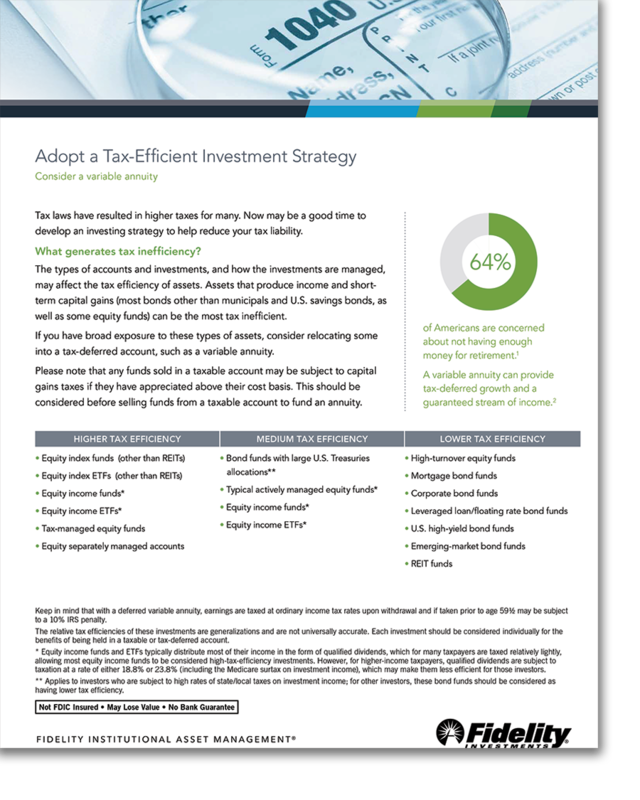 Thoughtfully allocating assets that do and don't benefit from tax deferral helps to fine-tune an investor's overall strategy. Investors need to understand the tax consequences of investing in mutual funds when developing a comprehensive investment strategy. 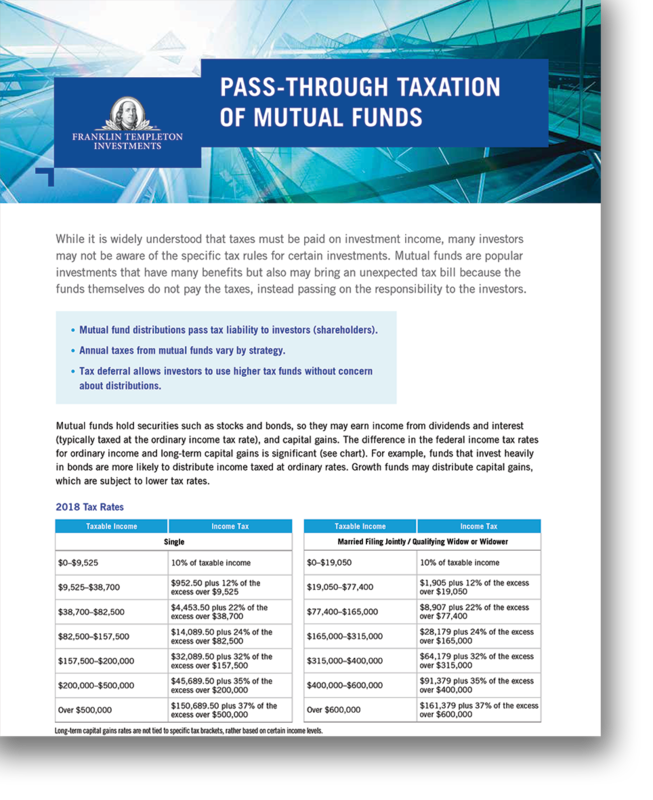 Investors can gravitate toward funds with a lower expected tax burden, but this creates fundamental limitations, particularly within certain sectors and actively managed strategies. Taxes may impact retirement goals—especially as tax rates on income, dividends, and long-term capital gains may continue to increase. 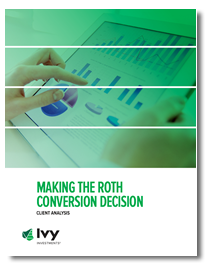 This worksheet and question guide can help discover if a Roth conversion is appropriate. 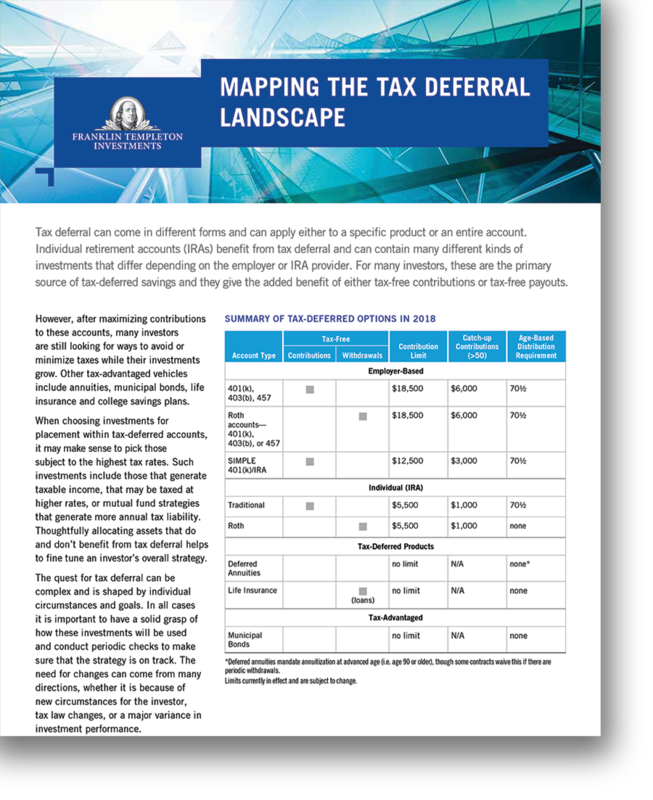 Long-term investors have long valued the impact tax deferral can have on their portfolios. For high earners, these benefits can be substantial. 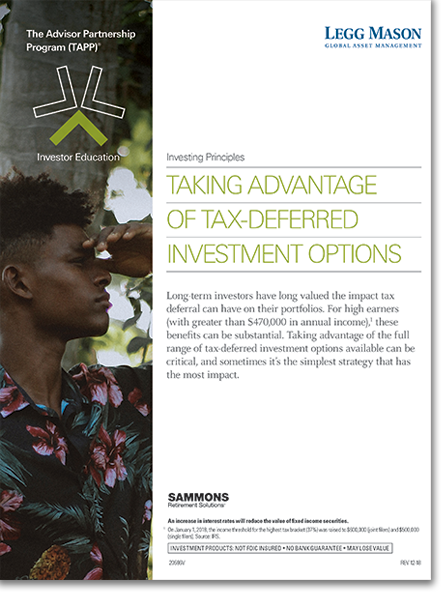 Taking advantage of the full range of tax-deferred investment options available can be critical, and sometimes it's the simplest strategy that has the most impact. 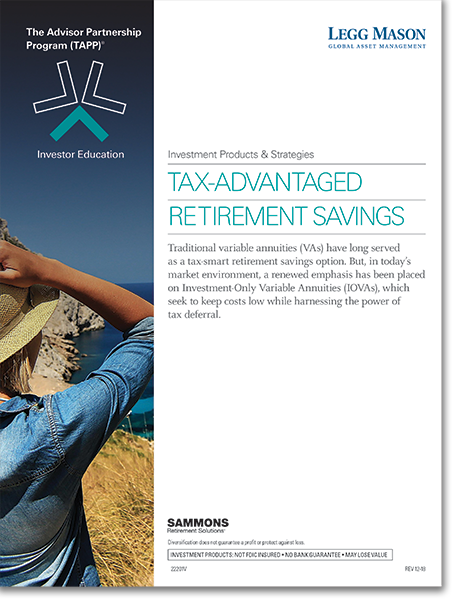 Traditional variable annuities (VAs) have long served as a tax-smart retirement savings option. In today's market environment, a renewed emphasis has been placed on Investment-Only Variable Annuities (IOVAs), which seek to keep costs low while harnessing the power of tax deferral. The 2018 Tax Cuts and Jobs Act generally reduced tax rates and tax burdens for many Americans. This tax law resulted in one of the most significant changes in taxes and tax rates in decades. 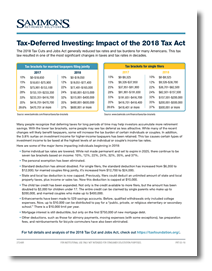 This one-page resource reviews the power of tax deferral along with some of the major items impacting individuals beginning in 2018. Factors to consider when claiming benefits including full retirement age, when to take Social Security, and opportunities to maximize benefits. 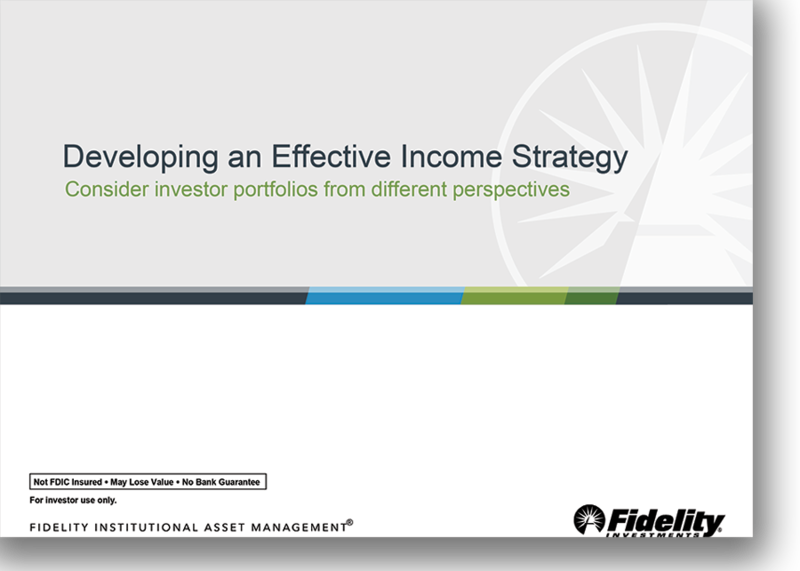 An investor presentation covering options to help investors maximize benefits. 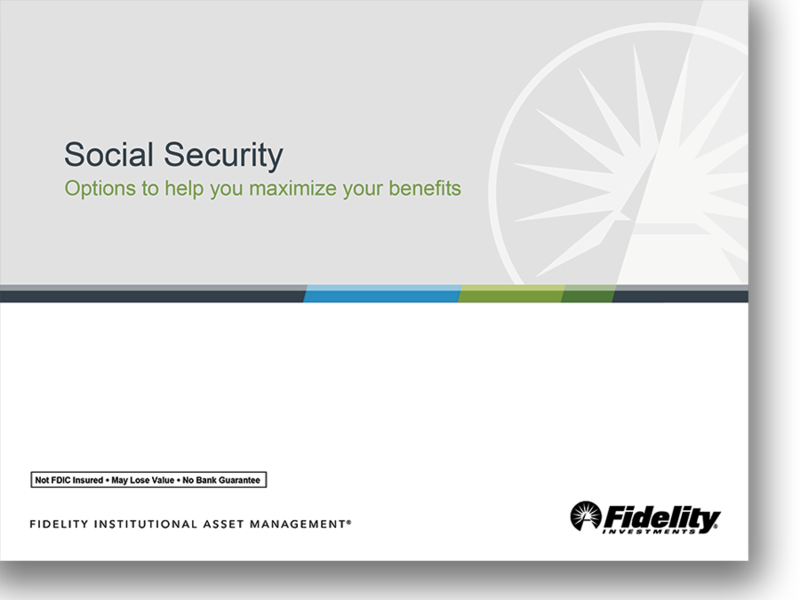 Covers topics on Social Security essentials, benefits and options, strategies to consider, and next steps. 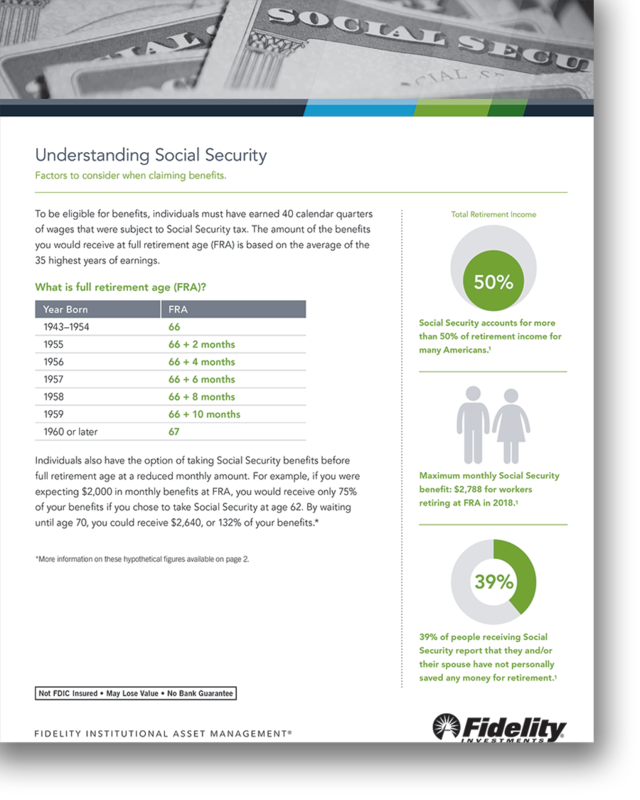 Social Security Retirement Benefits: What Are They Really Worth? Most Americans pay Social Security taxes throughout their working lives, begin receiving payments when they retire, and expect those benefits to continue until they die. But few give thought to what those benefits are truly worth, or what it takes to produce an equivalent amount of income, or more, that is guaranteed for life. 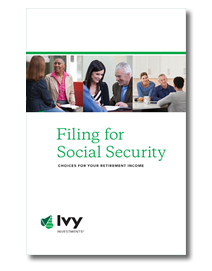 This is a general overview of certain rules related to Social Security and includes a workbook for clients to work through with their financial professionals as they determine their Social Security strategy. 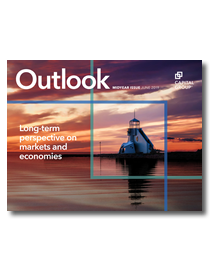 This is an annual outlook on the global economy provided by American Funds. 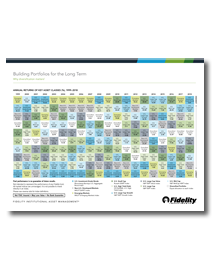 An investor presentation covering a three-pronged approach to constructing portfolios: practical, emotional, and mathematical. 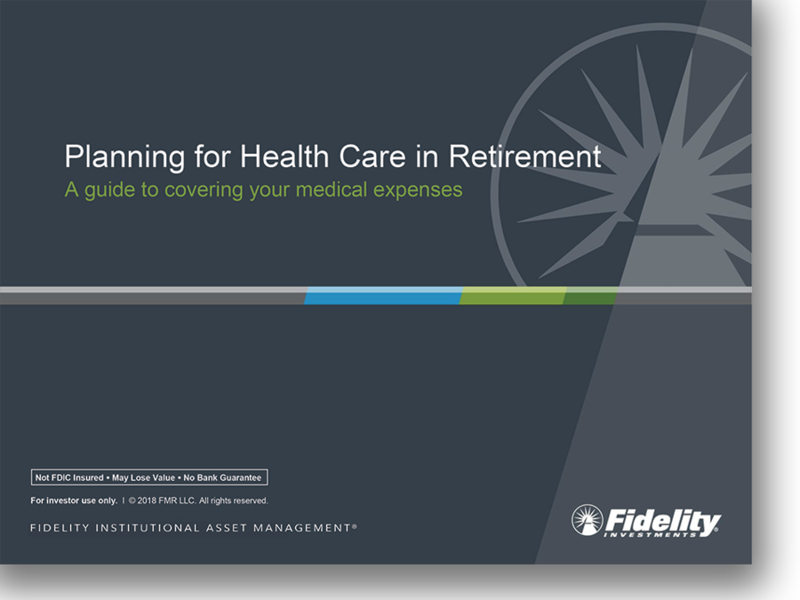 A presentation to guide clients on options to cover medical expenses. 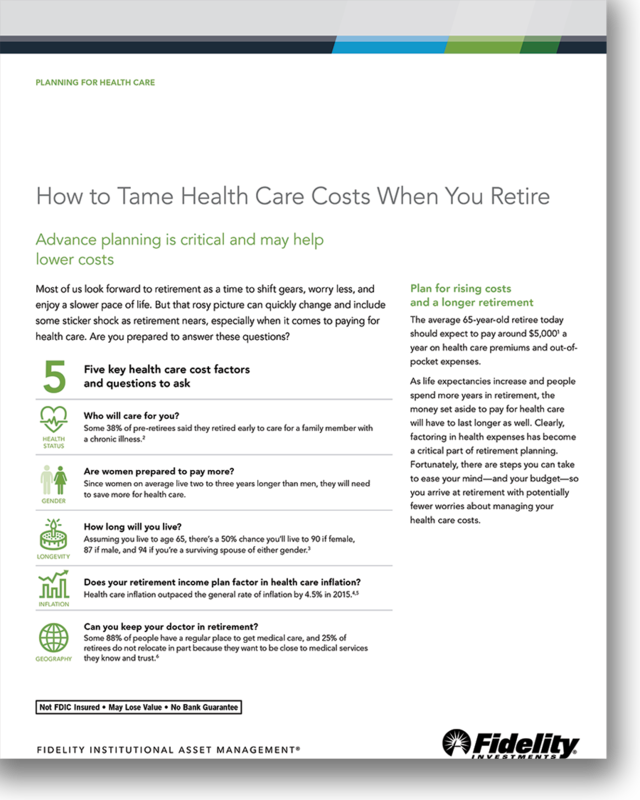 Covers topics to help gain insight into health care costs, look into what Medicare covers, and outlines a 4-step process for creating a health care plan. 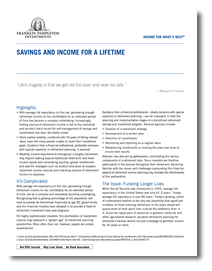 This white paper covers the need for advance planning and how it may help lower costs. 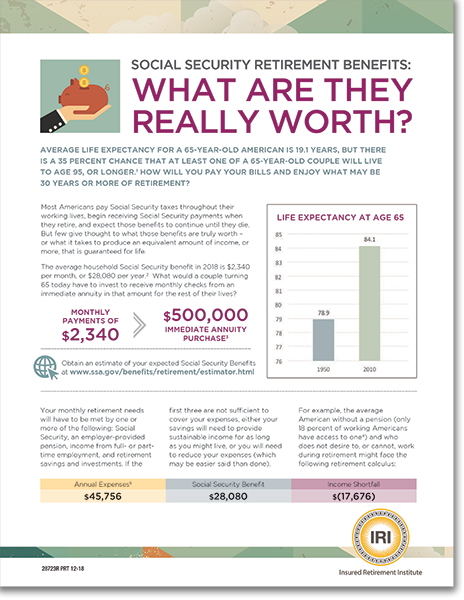 With average life expectancy on the rise, generating enough income to live comfortably for an extended period of time has become a complex undertaking. The volatility in the stock market and falling interest rates have left many people unable to meet their investment goals. Meeting income requirements throughout a lengthy retirement may require looking beyond traditional short-term and fixed-income assets and considering equities, global investments, and specific strategies such as product allocation to broaden income sources and match those income sources to expenses. 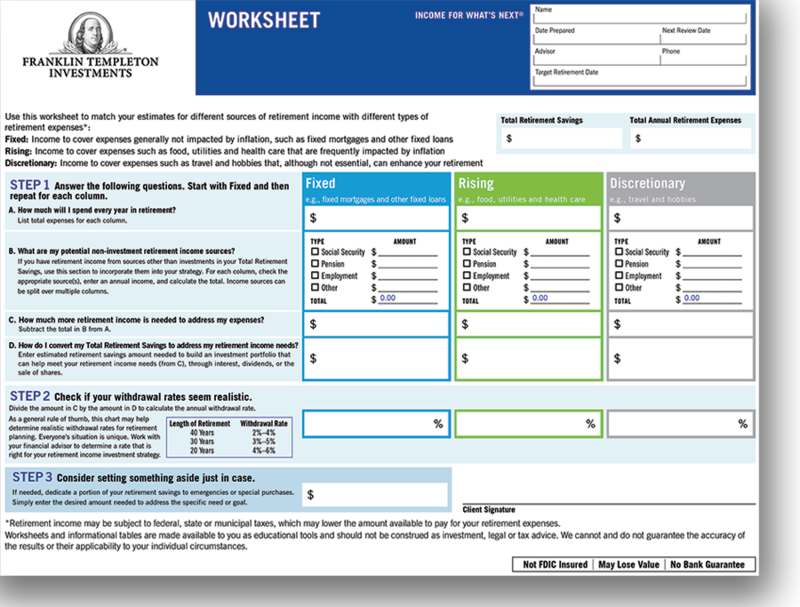 Use this worksheet to match your estimates for different sources of retirement income with different types of retirement expenses. 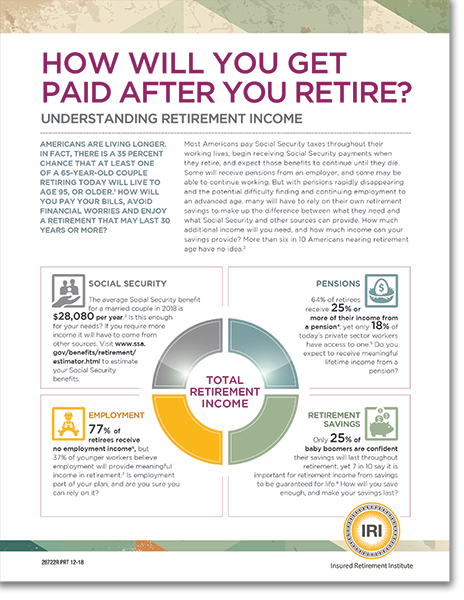 How Will You Get Paid After You Retire? How will you pay your bills, avoid financial worries, and enjoy a retirement that may last 30 years or more? 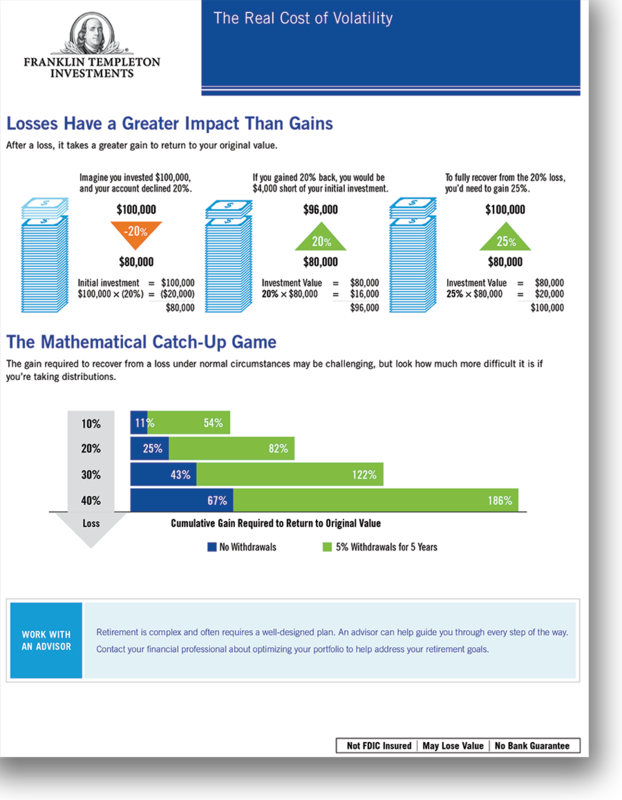 This piece graphically shows the gain needed to return to original value after a loss. 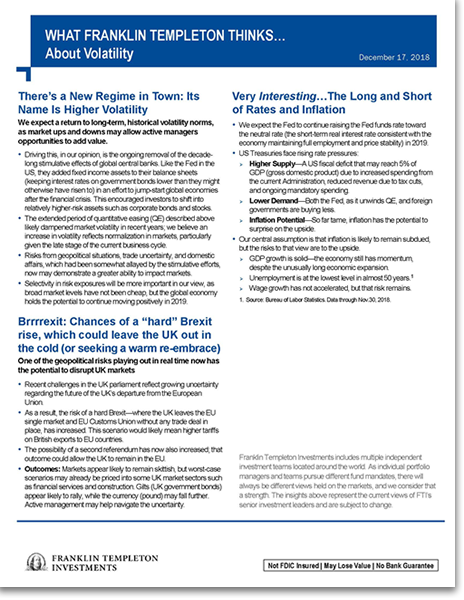 Franklin Templeton's senior investment leaders comment on a return to historical volatility, the chances of a "hard" Brexit rise, and the long and short of rates and inflation. While short-term volatility is never comfortable, investors focusing on their long-term goals should not fear rising rates. This piece contains four reasons why. 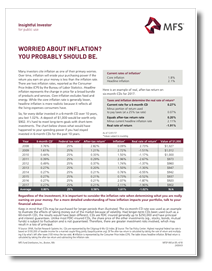 Many investors cite inflation as one of their primary worries. Over time, inflation will erode purchasing power if the return earned is less than the inflation rate. 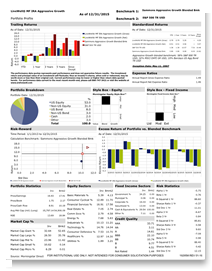 This document contains annual returns of key indices from 1995-2014. This document contains model performance information for the LiveWell Mutual Fund IRA. 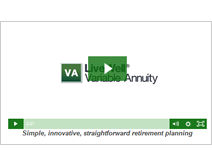 This document contains model performance information for the LiveWell Variable Annuity. 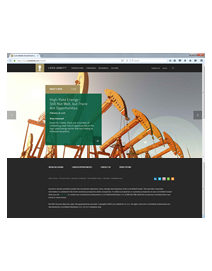 Morningstar associates updated the LiveWell® portfolios offered on the Sammons Retirement Solutions platform to reflect the results of the most recent financial and economic research. 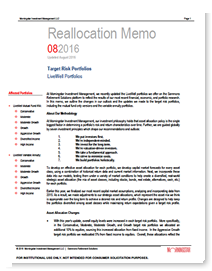 This memo outlines the changes in outlook and updates made to both the target risk and income portfolios, including the mutual-fund-only versions and the variable portfolio. 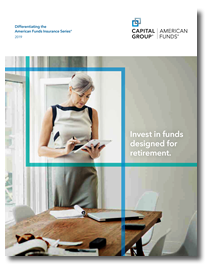 Since 1931, American Funds, part of the Capital Group, has helped investors pursue long-term investment success. Our consistent approach—in combination with The Capital System—has resulted in a superior long-term track record for American Funds Insurance Series (AFIS). 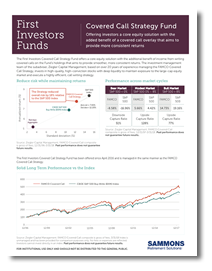 The First Investors Covered Call Strategy Fund offers a core equity solution with the additional benefit of income from writing covered calls on the Fund's holdings that aims to provide smoother, more consistent returns. 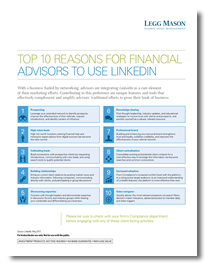 With a business fueled by networking, financial professionals are integrating LinkedIn as a core element of their marketing efforts. 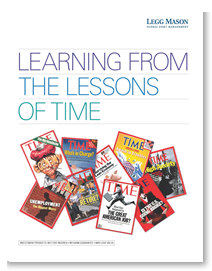 Contributing to this preference are unique features and tools that effectively complement and amplify financial professionals' traditional efforts to grow their book of business. 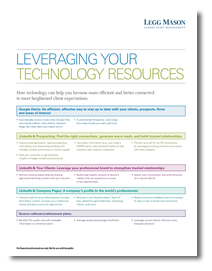 How technology can help you become more efficient and better connected to meet heightened client expectations. 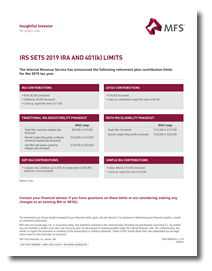 The Internal Revenue Service's (IRS) retirement plan contribution limits for the 2018 tax year. 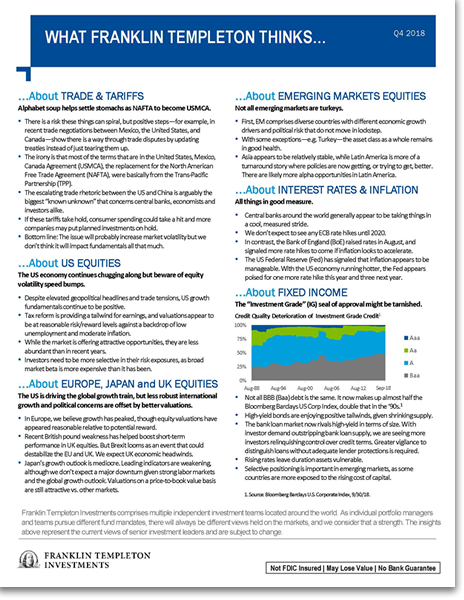 Franklin Templeton Investments comprises multiple independent investment teams located around the world. As individual portfolio managers and teams pursue different fund mandates, there will always be different views held on the markets, and Franklin Templeton considers that a strength. The insights expressed within this paper represent the current views of senior investment leaders and are subject to change. 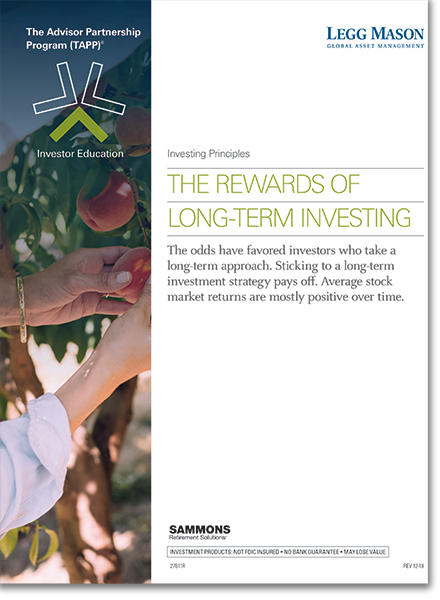 The odds have favored the investor who takes a long-term approach. This piece helps demonstrate why it can pay to stay invested. The year in which an investor retires can make a difference in how long their money will last. 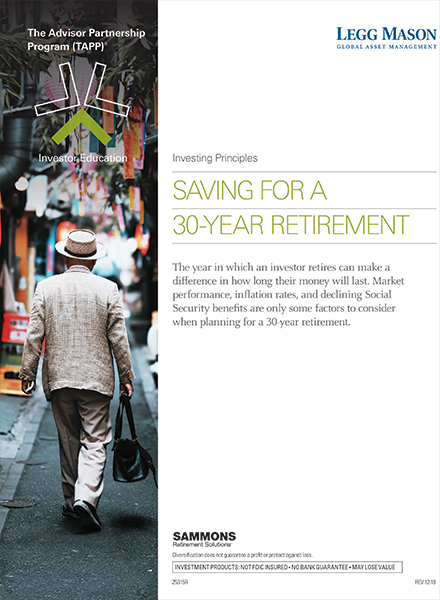 Market performance, inflation rates, and declining Social Security benefits are only some factors to consider when planning for a 30-year retirement. 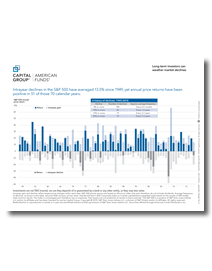 This chart shows the history of intrayear declines and annual price returns in the S&P 500 over the course of 70 years. During periods of volatility in the stock market, many people may doubt their long-term investment strategy. 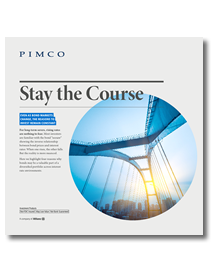 This resource provides five tips to help avoid common pitfalls and stay on track toward achieving financial goals. 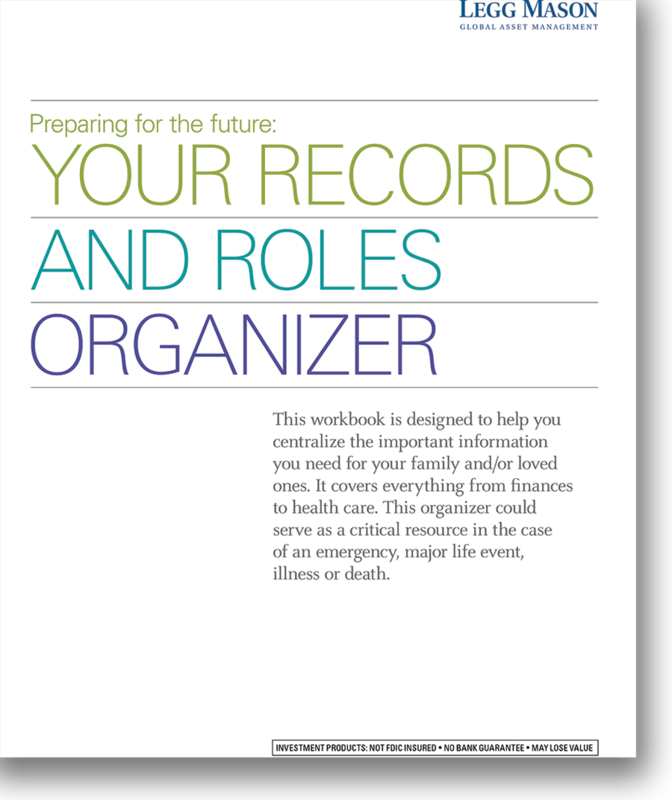 This workbook is designed to help you centralize the important information you need for your family and/or loved ones. It covers everything from finances to health care. This organizer could serve as a critical resource in the case of an emergency, major life event, illness, or death. Advisors who create experiences that better relate to each of the generations have the opportunity to cement a loyal client base and capture assets in motion. 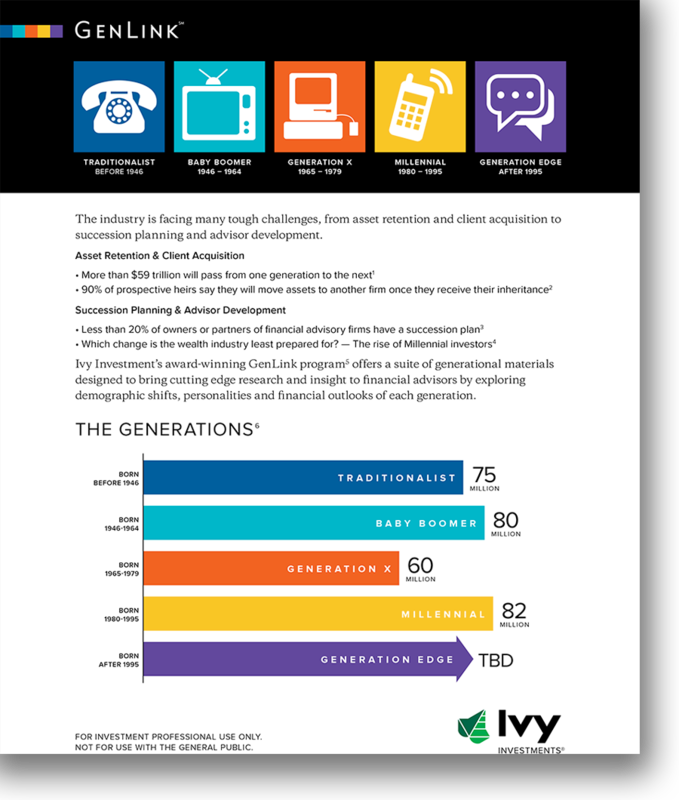 Find out why understanding generational differences makes a difference and how Ivy Investments GenLink can help you. 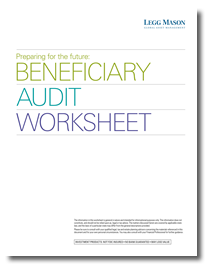 This document contains a beneficiary audit worksheet. Staying focused despite the day-to-day distractions of the market is never easy, especially during periods of economic uncertainty. 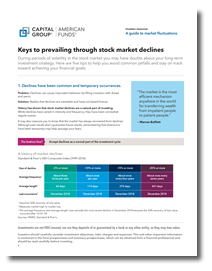 However, investors who seek the guidance of a trusted financial professional and remain committed to their investment plans—even when it's tempting to head to the sidelines—are better positioned to realize their short- and long-term goals. Your clients have an unprecedented number of investment opportunities, and you are uniquely positioned to direct them to a reliable investment specialist within your firm who can help them determine which options are right for them. 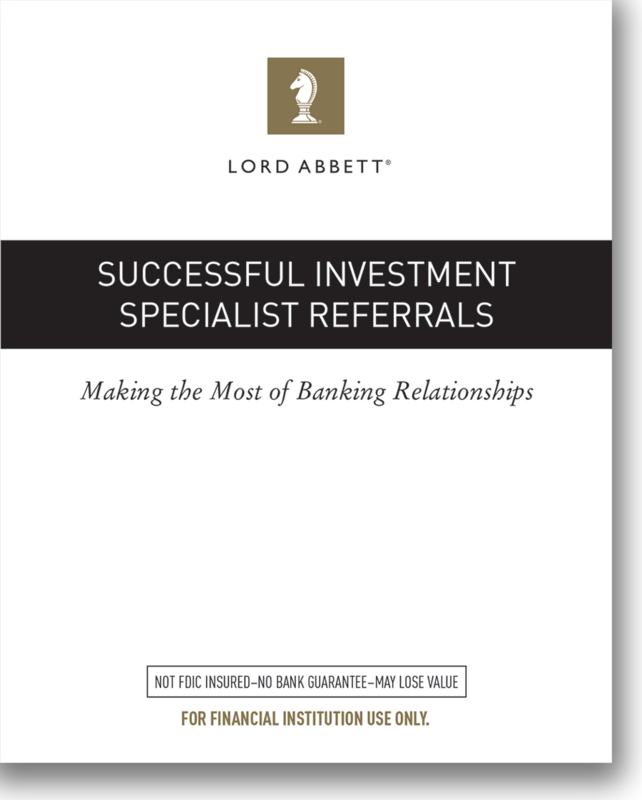 Each time you help one of your clients – with either a banking transaction or a request – is an opportunity. The LiveWell Mutual Fund IRA makes it easy to build a retirement solution tailored to your risk tolerance and investment horizon. 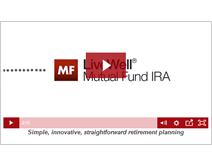 Watch this video to learn about the features and benefits of the LiveWell Mutual Fund IRA from Sammons Retirement Solutions. If your client is at least six years from retirement, the LiveWell Plus Mutual Fund IRA makes it easy to build a retirement solution tailored to your client's risk tolerance and investment horizon. 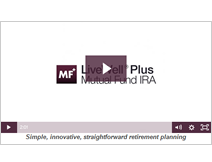 Watch this video to learn more about the LiveWell Plus Mutual Fund IRA from Sammons Retirement Solutions. The LiveWell Variable Annuity makes it easy to build a retirement solution tailored to your client's risk tolerance and investment horizon. 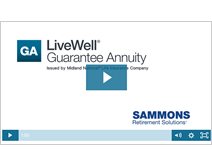 Watch this video to learn more about the LiveWell Variable Annuity from Sammons Retirement Solutions, issued by Midland National Life Insurance Company. The LiveWell Freedom Variable Annuity, issued by Midland National Life Insurance Company, helps provide income as early as the first stage of retirement, with innovative features to help deliver more financial freedom later in retirement. Watch this video to learn more. 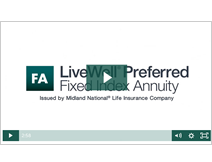 The LiveWell Preferred Fixed Index Annuity, issued by Midland National Life Insurance Company, provides all of the benefits of a fixed index annuity, plus options to provide income for life or legacy protection, depending on your clients' retirement goals. Watch this video to learn more. 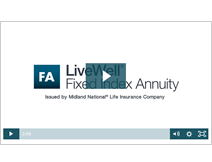 The LiveWell Fixed Index Annuity, issued by Midland National Life Insurance Company, provides all of the benefits of a fixed index annuity, plus options to provide income for life or legacy protection, depending on your clients' retirement goals. Watch this video to learn more. The LiveWell Guarantee Annuity, a Multi-Year Guaranteed Annuity issued by Midland National® Life Insurance Company, provides your clients with an option to lock in a fixed rate of return ... and the power to choose how long they want their money to grow. Watch this video to learn more. Fund companies listed above are not affiliated with Sammons Institutional Group℠, Inc., Midland National® and Sammons Financial Network® LLC, member FINRA. Investing in mutual funds and variable annuities involves risk, including the potential loss of investment. You should consider the investment objectives, risks, charges and expenses of the mutual fund or variable annuity and its underlying investment options carefully before investing. The prospectus and/or summary prospectus contain this and other information. You may contact your financial professional or call 866-747-3421 to obtain a current prospectus for the mutual fund or the variable annuity and its underlying investment options. Please read it carefully. Securities distributed by Sammons Financial Network® LLC, member FINRA. Insurance products are issued by Midland National® Life Insurance Company (West Des Moines, IA). Sammons Institutional Group℠, Inc. provides administrative services. Sammons Financial Network® LLC, Midland National® Life Insurance Company, and Sammons Retirement Solutions® (a division of Sammons Institutional Group) are wholly owned subsidiaries of Sammons® Financial Group, Inc.
Morningstar Investment Management LLC is a registered investment adviser and subsidiary of Morningstar, Inc. Morningstar Investment Management provides nondiscretionary consulting services to Sammons Institutional Group℠, Inc. (SIG) but is not acting in the capacity of adviser to individual investors. Morningstar Investment Management provides recommendations to SIG regarding asset allocation targets, for certain LiveWell® products/programs, which are subject to change without notice. Morningstar Investment Management establishes the allocations using its proprietary asset classifications. If alternative classification methods are used, the allocations may not meet the asset allocation targets. The Morningstar name and logo are registered marks of Morningstar, Inc. Morningstar Investment Management is not affiliated with SIG.